Iran–Syria–Hizballah–Hamas A Coalition against Nature Why Does it Work? [T]he only vital and effective axis in the region is that between Tehran and Damascus. They are the two capitals which enjoy a degree of strength and a measure of independence that allows them to remain unaffected by direct political pressure. In his 2007 annual review of global threats, the Director of National Intelligence, John Negroponte, highlighted an increasingly worrisome assessment of Hizballah—backed by Iran and Syria. 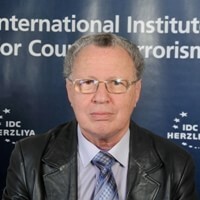 He warned that Iran was using terrorist operations abroad as a key element of its national security strategy and that at the center of Iran’s terrorism strategy was Lebanese Hizballah. To this “old” alliance one must add a newcomer, the Palestinian movement Hamas, an actor who, for years, has been derailing the fragile peace process between Israel and the Palestinians through the use of indiscriminate terrorism; an actor whose success in taking control of the Palestinian Authority could bring an end to any hope of solution to this central conflict.